Selling your house can be daunting. Sometimes you may feel like your home is worth more than people are offering for it. 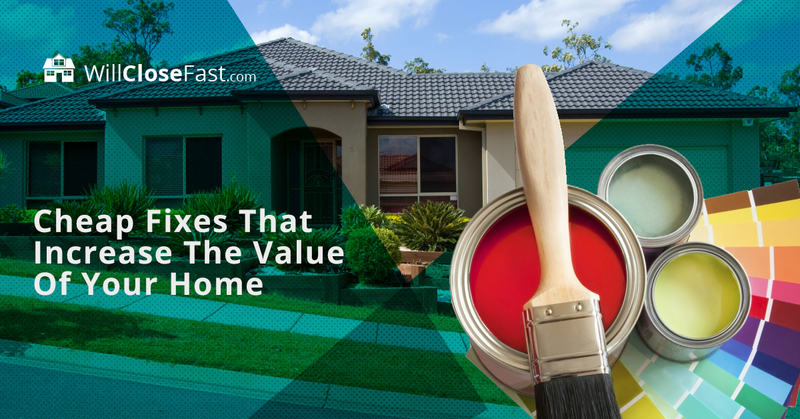 Here are five easy and cheap improvements you can do yourself to increase the overall value of your home. Paint… everything! Freshly painted walls give a facelift to any room, and that can definitely up the value of your home. Choose a neutral color to appeal to the most buyers. Grey is a hip neutral color that is more modern than beige, yet not as shocking as white. But don’t stop at your walls. Give your baseboards and windowsills new life as well! White baseboards look clean and modern. Just be sure to use masking tape and protect your floors for a seamless finish. Clean up your yard. Curb appeal is everything these days. If your yard is overgrown, spend a weekend giving it a good trim. Make sure your grass is green and thick with no bare patches. Prune any overgrown bushes and shrubs, and make sure all dirt is swept from walkways. Add mulch around trees to finish off the look. We beg you, get rid of that popcorn ceiling. At one point popcorn ceilings (also called cottage cheese ceilings) were all the rage. However, today most people turn their noses at a popcorn ceiling. To complete this do-it-yourself job, you’ll need a ladder, a scraper, and a lot of patience – but trust us, this fix is nearly free and will do wonders for your resale value. Most hardware stores will even sell a softening solution to help the process. Just be sure your ceiling doesn’t contain asbestos, and wear a mask and goggles as you will surely be covered in popcorn by the end of the project – and not the kind you can eat. Focus on the kitchen first. Kitchen updates by far add the most value to your home. These renovations may be more expensive than scraping the popcorn off a ceiling, but they are well worth the investment if you can swing it. Simply updating appliances is a great place to start. As evident on HGTV home remodel shows, many buyers are enjoying a bright, clean kitchen. Giving wood cabinets a coat of white paint and adding a light colored tile backsplash can reap great returns on investments. Replace hardware. A rusty faucet or cracked mirror is a great way to turn off potential buyers. Updating any hardware, from doorknobs to handle to light switch covers will make your home appear newer and well taken care of. While the above ideas are great and will increase the value of your home, we know that not everyone has the time, money, or desire to fix up their home. That’s where we come in. At Will Close Fast, we buy ugly houses, rundown houses, and houses that you think no one else will want. Even if your house is in great shape but you simply need it off your plate, we’ll still make a fair cash offer. If you are wondering, “How much is my house worth as-is,” check out our home value estimator to get started. Contact us today to learn more about selling your house for cash!